The word “idiot” has been searched for more than one million times, following testimony typing it into Google Images threw up pictures of President Trump. 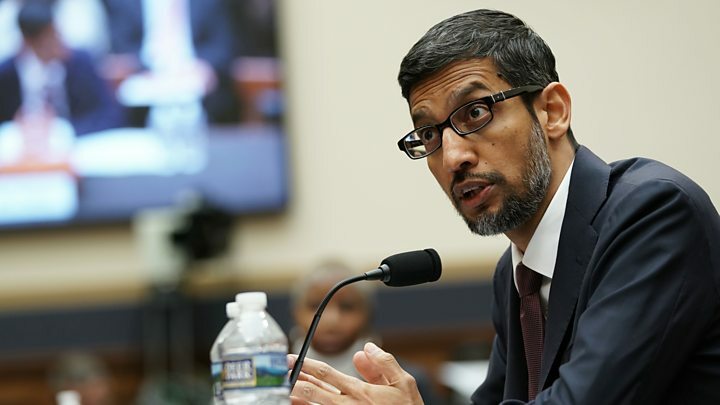 The link between the two was mentioned during a congressional grilling of Google chief executive Sundar Pichai. He was asked whether this was an example of political bias in algorithms, something he denied. According to Google Trends, “idiot” is currently the number one most searched for term in the US. Democratic congresswoman Zoe Lofgren posed the question about why “idiot” highlighted results that included pictures of the president. “How would that happen? How does search work so that would occur?” she asked. Mr Pichai replied that Google search results were based on billions of keyword ranked according to more than 200 factors, including relevance and popularity. “So it’s not some little man sitting behind the curtain figuring out what we’re going to show the user?” responded Ms Lofgren. Republican members of congress continued to grill Mr Pichai, with Steve Chabot asking why, when he searched for news about his party’s health care bill, only negative news appeared. Mr Pichai replied that equally negative news was highlighted when people used the search term “Google”. The link between the term “idiot” and pictures of President Trump emerged earlier this year, with some linking it to the fact British protesters had pushed Green Day’s song American Idiot to the top of the UK charts during a presidential visit in July. That was followed by users of the website Reddit posting articles that contained pictures of President Trump alongside the word “idiot”, in an attempt to manipulate the search engine database, in a practice known as Google bombing. It is not the first time a US president has been linked to an unfortunate tagline. In 2003, a search for the phrase “miserable failure” highlighted pictures of President George W Bush. The hearing also revealed that some members of congress had only very basic knowledge of the technology industry. Republican Steve King asking Mr Pichai to explain why his granddaughter’s iPhone was acting strangely. In response, Mr Pichai explained the phone was not made by Google. Posted in Blog, News and tagged #google, #mcsc, #messiah, #News, #TheMessiah, #trending, #trump, Idiot, Idiot' Trending, messiahcybersecurityandconsultancy.